A few weeks ago, my girlfriend and I took another camping trip for the long weekend over Columbus Day weekend. We love to travel and visit new places, and I think that camping is one of the best ways to experience this. Even if you aren’t that much of an outdoors person, I would still recommend giving it a shot. Maybe try car camping or staying in a cabin first and see how that works out. You can always go for a weekend somewhere closeby and if you hate it, nothing is stopping you from leaving and going home. In the summer we were able to stay in a cabin for a whole week for only $220, and were able to see some the coolest waterfalls in the Northeast. If you use a tent site, that price would be even cheaper as sometimes you can find sites for around $10-15 a night! This trip was no different, as we stayed in a “mini” cabin for 3 nights for around $140. It was a little pricier than the previous campground but it was still a great value. 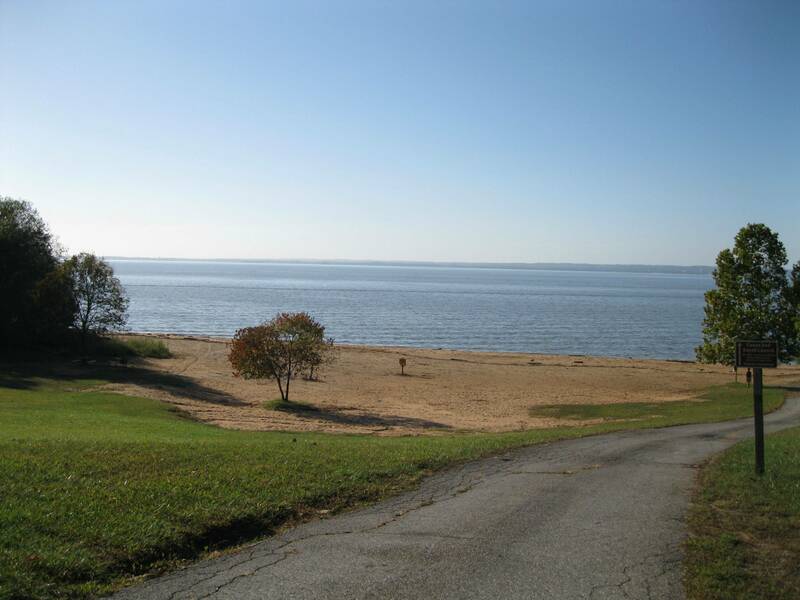 Elk Neck State Park is located in North East, Maryland and for those not familiar with the area it is right in the middle of the Chespeake Bay on a little peninsula, which divides Maryland right in half. The area itself and the park is really gorgeous and there is plenty to do while you are staying there. There is a bunch of hiking trails throughout the park, and one of them goes to a lighthouse that overlooks a cliff. We really enjoyed the trail that was up on the “mountain” area and the bluffs area. There were some even cooler views of the bay from those trails. 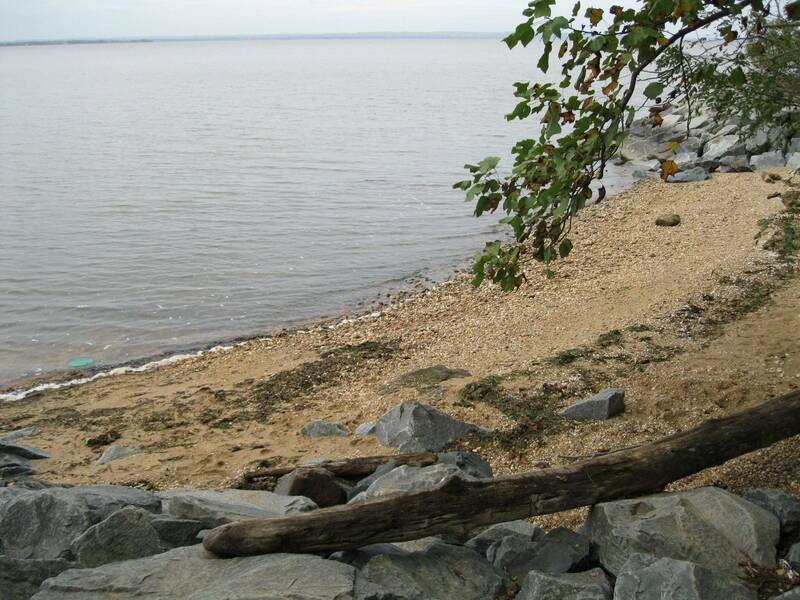 If you are visiting in the Summer there is a huge beach on the bay, a snack stand, and kayak rentals. There are plenty of picnic tables and even grills to cook your food at and there are a few playground areas, basketball courts, and a small baseball field if you have kids. There was also a nature center that ran a few programs, unfortunately we missed them as they were a little earlier than we would have liked, haha. I’m sure that during the Summer the nature center runs even more events. We stayed in one of the little mini cabins that they offer, as the other cabins get closed for the fall/winter. 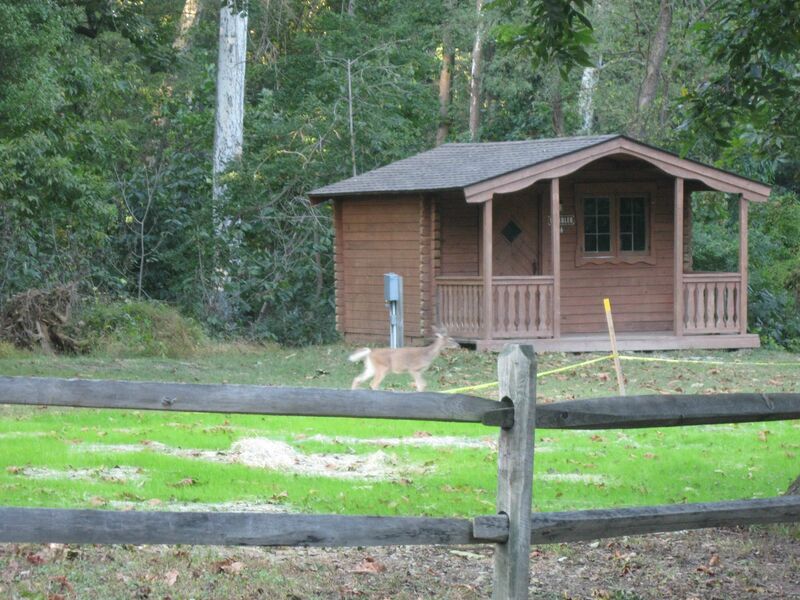 The mini cabins have a double bed and two bunk beds, as well as a heat and air conditioning unit. They are very basic and just a place to sleep. They have a little front porch with an overhang and then they also have a picnic table and fire pit out front, as do all the other sites. The little cabin was pretty awesome, seemed to be well kept. The only complaint that we had was the amount of stinkbugs that seemed to be living inside of the window which led to them living inside the cabin too…there had to be at least 20+ in there. I’m not sure if it was the time of year or what, but that was only the really drawback. Luckily we had a spider friend out front that killed quite a few of them! The bathrooms were located in the camping loop directly next to all the cabins, so it was a short walk but not too bad. There is a pretty clear path to the bathrooms so you can get to them easily even at night with just a flashlight. The bathroom themselves were very clean and fairly new looking, the campground host or a ranger cleaned them everyday, fully stocked with toilet paper as well as soap. The showers were individual stalls and the water was hot so we had no complaints there – these were actually some of the best campground bathrooms I have seen. The park has an extensive campground store which basically sold anything that you might have forgot at home, it was pretty impressive. The staff in both the store and the park staff in general were very friendly and helpful, even though we didn’t need much during our stay. There were no prices listed though, so I’m sure nothing is cheap here as you are paying for convenience but it’s great if you do forget something. I’d recommend bringing everything you need if possible and for the things you forgot, there is a Food Lion grocery store on the highway north of North East, MD. The camp store would be my last resort. The store also sold ice for a little over $2, which was a fine deal. The convenience store and the grocery store charged a similar price. The store also sold bundles of firewood for $5, but on the road to the park you can get more value for your money from quite a few locals selling firewood. We were also able to scrounge up plenty of smaller branches and sticks for some kindling. Overall I would recommend this park, and we would definitely stay here again – maybe in the warmer weather to take advantage of the boating and swimming. The mini cabins are great if you want the air conditioning, but I also found a lot of the tent sites to good – spaced out and pretty large. I reccomend looking at them on campsitephotos.com before picking one out. The full size cabins have a double bed and bunk beds as well, but they also have a full refrigerator, stove, and running cold water. They do NOT have heat or air conditioning though, so that’s why they were closed when visited. I really don’t think you can go wrong at any choice of location in this park, and it’s a great little getaway.